We’ve had some unexpected warmer weather recently so to make the most of it I made a trip to the nearest coast; Southend. 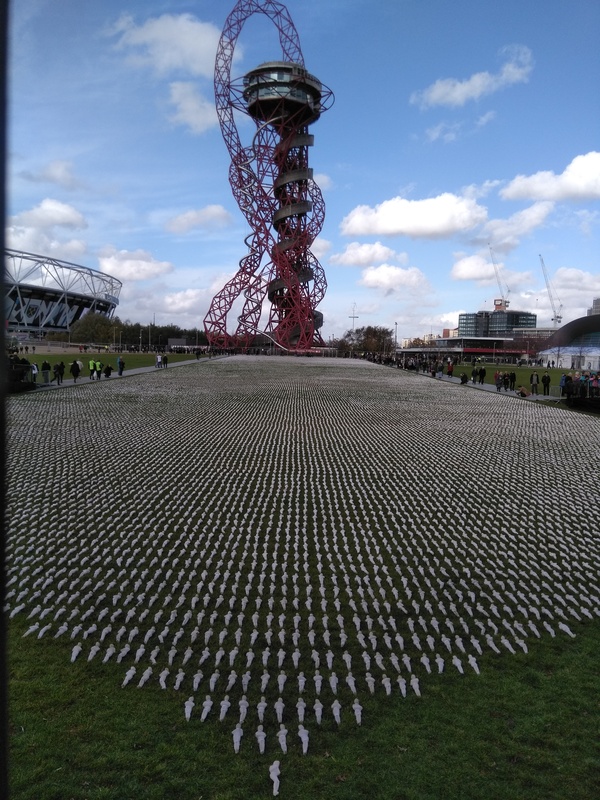 My last visit was a few years ago so I was keen to see what had changed. I love being by the sea, I find it so calming and it’s always a welcome change of scenery. When I arrived it was still a little hazy and misty so the sea wasn’t quite as clear as I expected. Looking across the fairground rides the sea looked welcoming. Walking down to sea level, the first thing I did was head towards the longest pleasure pier in the world at 1.34 miles long. 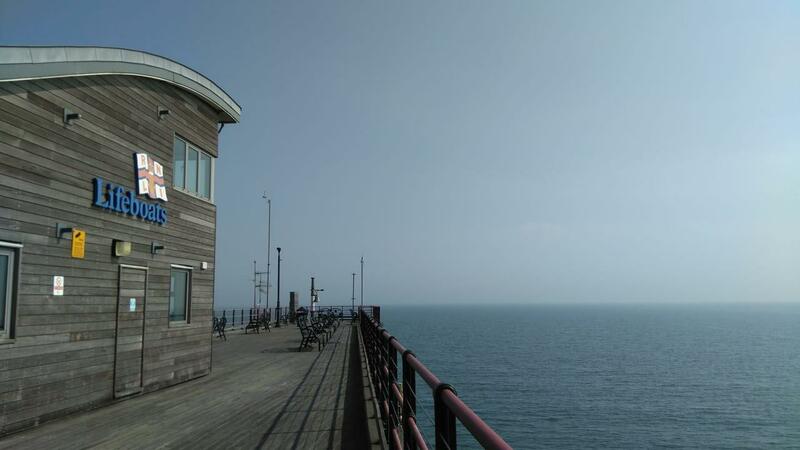 Walking along the pier is a must for me and I wanted to do this before it got busy. Walking along the pier there were benches where you could rest. I loved that each one I came across had a pretty seaside themed silhouette scene on the backrest. Eventually I reached the top of the pier where there surprisingly, some colourfully decorated beach huts. I thought they looked great, especially as the sun had now come out through the clouds and made the colours pop. I think my favourite was the rainbow one with the giant silver ball on the roof. There was also a restaurant and a RNLI Lifeboat base and giftshop, so I bought a few souvenirs for my sisters. After taking in the view and soaking in the warm, bright sun at the top of the pier I decided I should head back to the coast and get some lunch. There’s a train that runs along the pier too but I decided to walk back as I was in no rush. Having had lunch I decided to take a walk along the beach and take in the view from the coast end to the pier. The beach is a pebbly one and there were lots of seashells and oyster shells scattered throughout. I picked a few up before finding a spot to rest. By late afternoon the wind was feeling cooler so I headed back to the station. On my way back I found some really cool street art, which I stopped to look at and admire. The train home was quick and easy and I left Southend feeling refreshed. I hope to visit again soon and would definitely recommend a visit. One of the many things I love about London are the quirks that you unexpectedly come across. There’s old and new sitting side by side and some really creative and fun quirks. Here’s a few that I came across in my recent visit that made me smile. 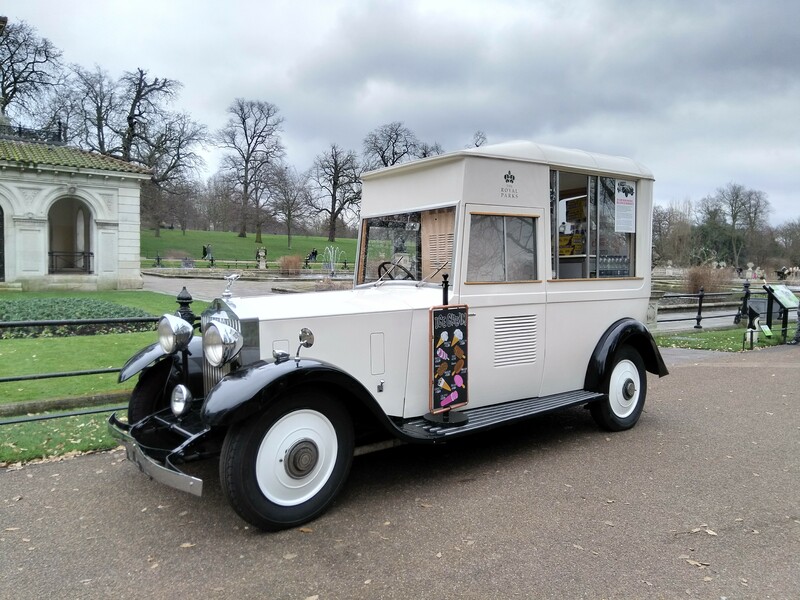 I went to Hyde park and came across a lovely vintage car. Upon closer inspection I saw that it had been transformed and was selling ice cream which I thought that was a wonderful idea. 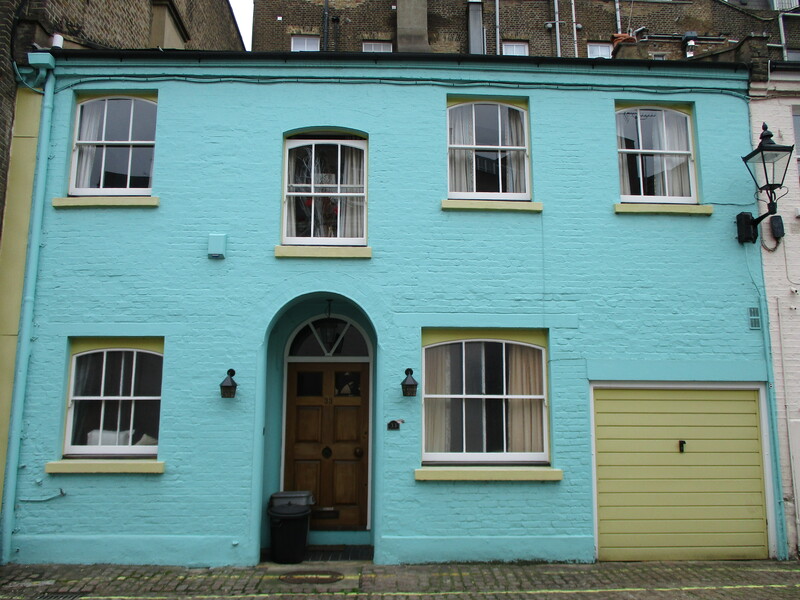 Further on I discovered this bright blue house. I love how bold and vibrant it is. Also on my wonderings around London I came across a really high pink building, which I thought was a unique colour and some really pretty floral displays which made me feel Spring was on it’s way. I wasn’t in London for very long but I enjoyed coming across some lovely, quirky things. I look forward to my next visit and will keep my eyes peeled for more curiosities which in London are always just around a corner. 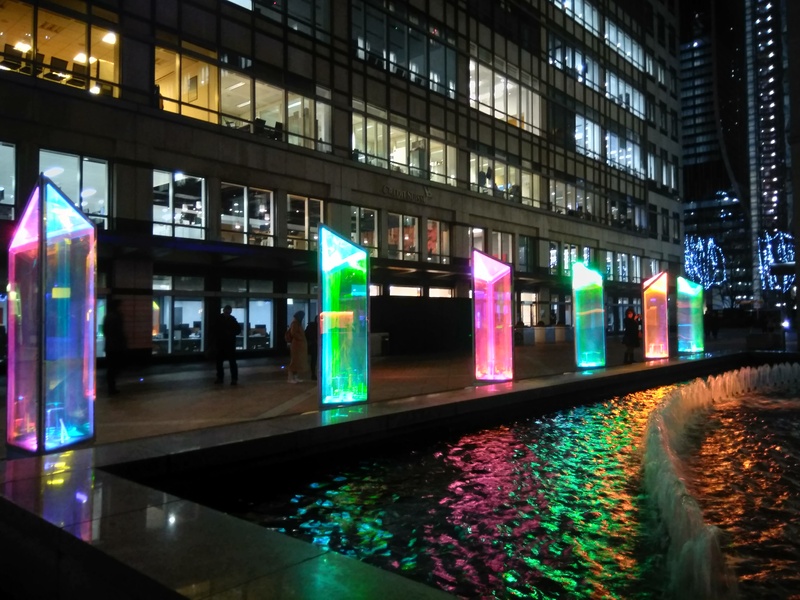 Canary Wharf is hosting it’s Winter Lights event again this year and last night was the first night it was on, so I, along with my sister and niece, went to see what colourful, creative displays would be on show. Stepping out of the station we were greeted with one of the most popular displays. This consisted of coloured light balls hanging on wires in neat rows, changing colour in time with the rhythm of the music that was being played. 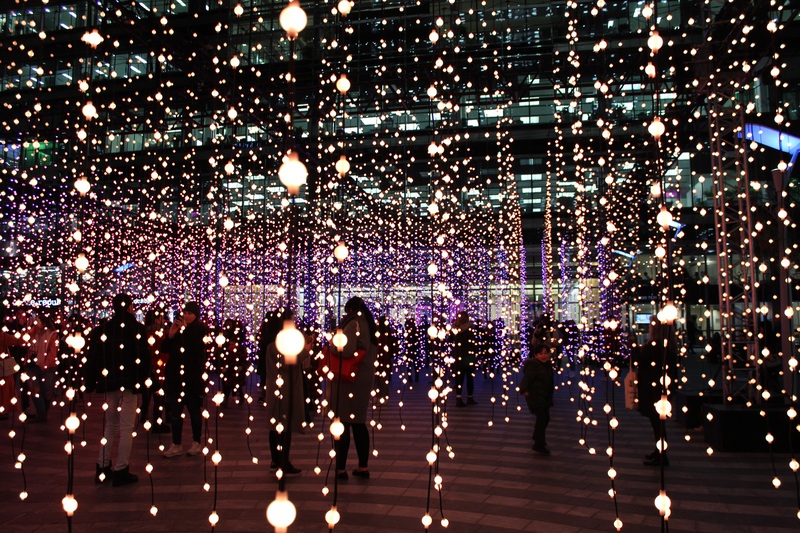 It was quite surreal standing in the middle surrounding by these lights and really fun one. I did, however, find it really tricky trying to get a good photo. I also thought the recycled plastic insects were interesting which didn’t have any light but the fluorescent paint made them glow. And the lit up hopscotch game made me think of when I used to play when I was younger (and yes I did have ago!). Some of the installations had music or sounds to go along with them, like the lines making up the shape of a whale, which emitted whale noises and moved like one too. The fountains had playful music along with varying shapes and colours the shooting water made which I quite enjoyed. One thing I noticed was that there was a lot of colourful pieces this year. The lit up, colour changing maze was one, and was quite fun, but the other piece I really liked were the beautifully colourful prisms, that you could spin to create a reflective effect. These were also tricky to photograph as people kept spinning them really fast but I finally got a decent shot. Next we walked up to the square filled with glowing, colourful trees making them seem almost dreamlike. This one was nice just to sit and look at, giving us a chance to have a little rest. I think one of the most clever and interactive installations was the colourful bench that when you put your hand on the sensor showed your heartbeat in lines and patterns along where you were sitting. I also liked the animal silhouettes that walked along the water edge with corresponding animal sounds playing around you, something simple but effective. It took us a few hours to find all the installations, by which point we were pretty cold and tired, but we did all really enjoy the event. The Winter Lights event is on for 2 weeks and I would definitely recommend if you happen to be around. Just remember to wrap up. I visited Camden again not too long ago to show my niece around the markets and to look for some street art, which is always great. It was a rainy day but we didn’t let that dampen our enthusiasm. We first walked through Little Venice which holds canal boats, has pretty bridges and willow trees with drooping branches. There was a also a section where people had started to attach locks to the gates that was interesting. Next we headed to the markets to get out of the rain for a while and to get something to eat. As well as food stalls there were lots of shops and stalls which had really cool and beautiful things. I especially liked the Moroccan style lamps and the retro cameras. Having dried off a little we decided to head back out and see what street art we could find. It didn’t take us long to find some colourful, creative, amazing artwork. I love Dan Kitchener’s work and have seen it in several spot’s around London, and this rainy scene was very apt for the day. I also really liked the girl with flowers in her hair and the couple standing under a running tap, although it’s a shame that was spoiled a little with the black spray over it. There was street art on huge walls as murals, in doorways and around almost every corner, so it took us a while to go around. I was familiar with some of the styles of some artists so it was great to see what new pieces they had done. I liked the coloured, squared doorway, something I can imagine having in my home, and the solemn looking girl I thought was really striking. We eventually made it back to the station, having found dozens of new street art pieces and feeling quite satisfied, if not a bit wet. And my niece didn’t think Camden was quite as peculiar as I made it out to be. Street art is always changing, which is one of the great things about it, and Camden and other places in London really encourage street artist to be creative and bold, which I hope to see more of. As 2018 draws to a close, it’s natural to reflect back on the year. I hope that you all have had a significant and positive one. 2018 for me has had some highs, such as having a new niece join our family, starting a new job, as well as experiencing fun, new things such as taking a candy making course. I’ve also been able to visit new places and had a break away with my family. My lows have been feeling unmotivated and uninspired at times to post on my blog, and wondering if it’s still relevant. I have also felt like the world is passing me by and that I have so much I still want to do. I leave you with some of my favourite photos of the 2018 and I wish you all happy New Year and with the hope that 2019 is one of fullfillment, happiness and adventure for all of us. 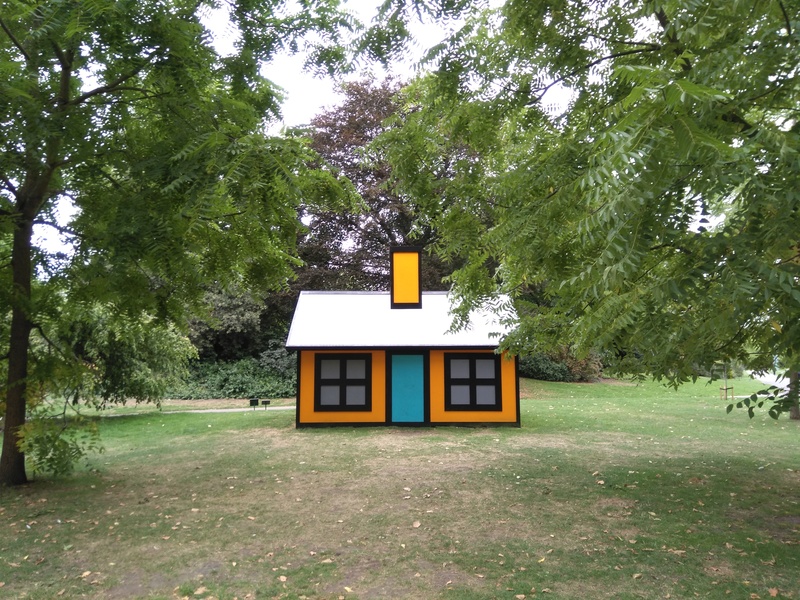 I visited London’s Regent’s Park earlier this year to look at the sculptures that had been placed there by Frieze. I visited last year and really liked some of the interesting sculptures displayed so was keen to see what new ones would be on show this year. There were 25 sculptures by various artists on show, some were quite strange, others fun and a few quite eerie. I also liked the cute by creepy Dancing Clog Girls, and the giant Emperor penguin. My other favourite piece was the gold leaf with colours on the inside, I loved how the colours emerged from the gold frame as you walked past the sculpture. 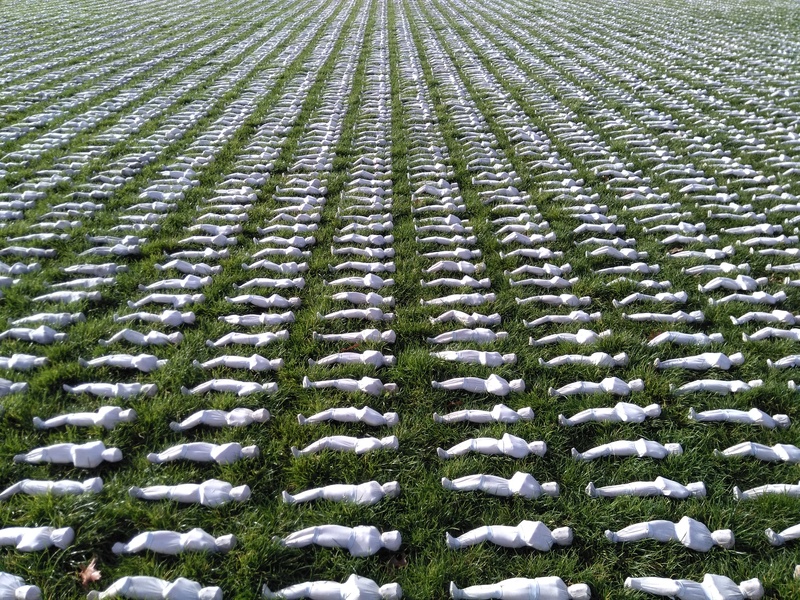 I found the headless sculptures quite haunting, these depicting the ghosts of those slain in the Marikana Massacre. A few others stood out too for met too; the huge anvil with the hare perched on top and the lampposts that had been tangled together was interesting. The girl resting on her side was based on Alice in Wonderland and looked quite serene to me. 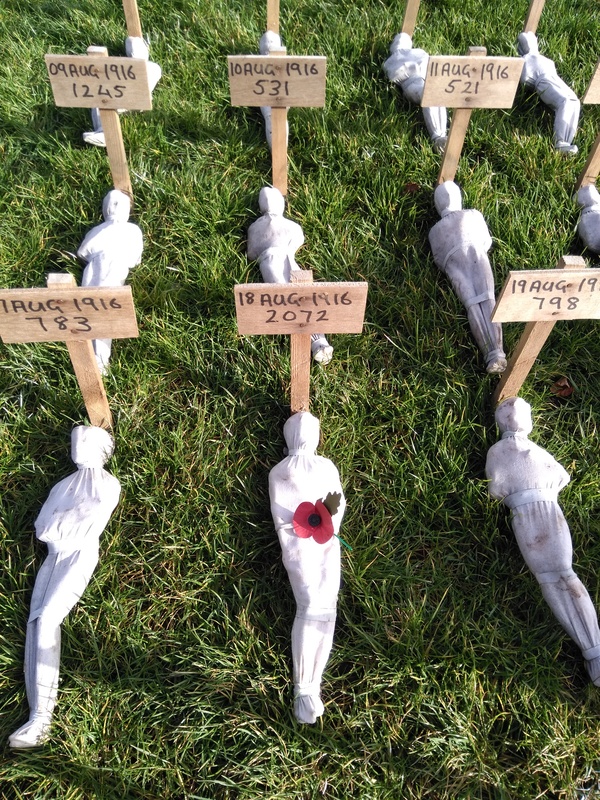 I thought the sculptures this year were quite interesting, each emoting quite different feelings from the viewer, especially the ones that were reminders of darker times. I really enjoyed my visit and look forward to seeing what the Frieze presents to us next year. I’ve been to London a few times these last couple of months, and as the Festive season has approached I’ve seen lots of interesting, pretty, bright decorations and trees being put up. I thought I’d share some of the ones that I just had to stop and snap. Some looked better in the day time or in bright light. I really liked the neon trees that have a simple shape and design and really caught my eye, and I loved the huge, moving robot on the tree at St Pancras station – something very different. Then there were others that sparkled in the night when the sun went down, the presents atop the car in Covent Garden was a fun display, but I think I really enjoyed looking at the tree at King’s Cross alongside the mini fountains, and the light bouncing off the water. It’s always fun walking around London, finding things that you least expect, and it’s been even more interesting in the darker, colder months when coming across the unexpected, brings a smile to your face. I hope you all have a great festive season and have a lovely time with family and friends. It’s been really cold in London very recently leading to some significant snowfall. It doesn’t snow a lot here but among the travel chaos and freezing temperatures, the snow looked beautiful. 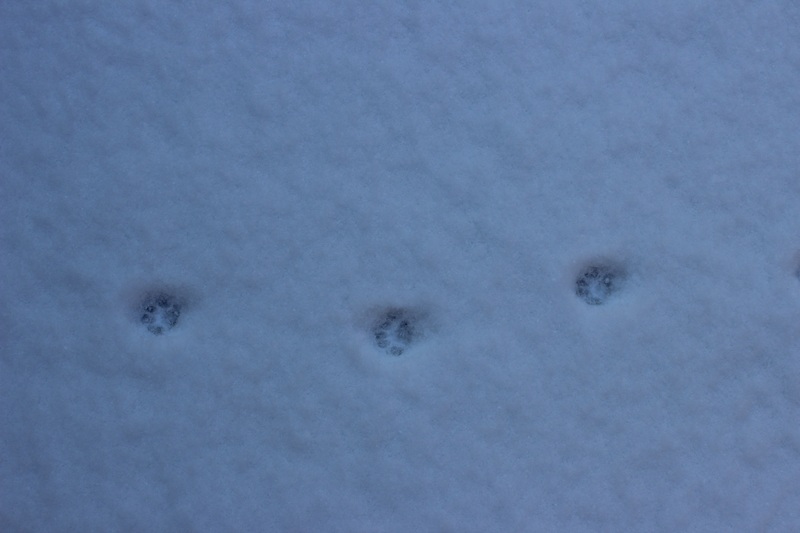 As per usual the cat stayed tucked away somewhere, having ventured out in the garden first. 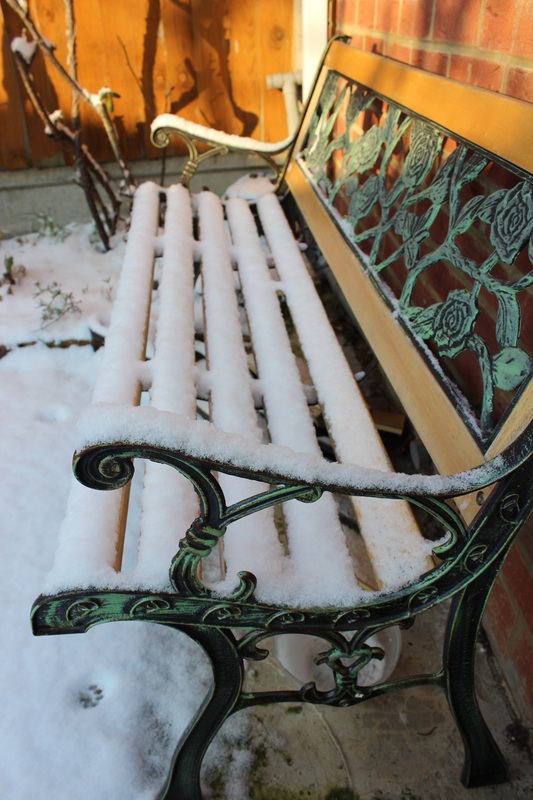 And our garden bench looked very pretty and wintery in a layer of snow. In the centre of London grand buildings looked even more scenic with a snowy surroundings. Most of it has melted away now and everything is back to normal. It was nice to have a blanket of snow for a while that can transform a landscape, even amid the chaos and cold. London has been looking very Christmassy these couple of months, and on my recent walks around the city here’s some of what I’ve come across. Covent Garden has lots of decorations up. I really liked the lights on Oxford Street, especially the glittery, golden waterfall inside one of the department stores. My favourites was the trees made up of fluorescent coloured lights at Liverpool Street, in Shoreditch. It’s really lovely to see all the effort that has gone in to making London festive and bright for this time of year.